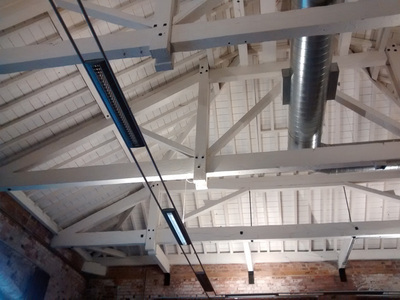 Inspiration - While attending the Winter Ales Festival at the Derby Roundhouse, I found myself in the carriage room, looking up at the roof. Apart from the modern strip-lighting, it was what I had always envisaged for the warehouse. 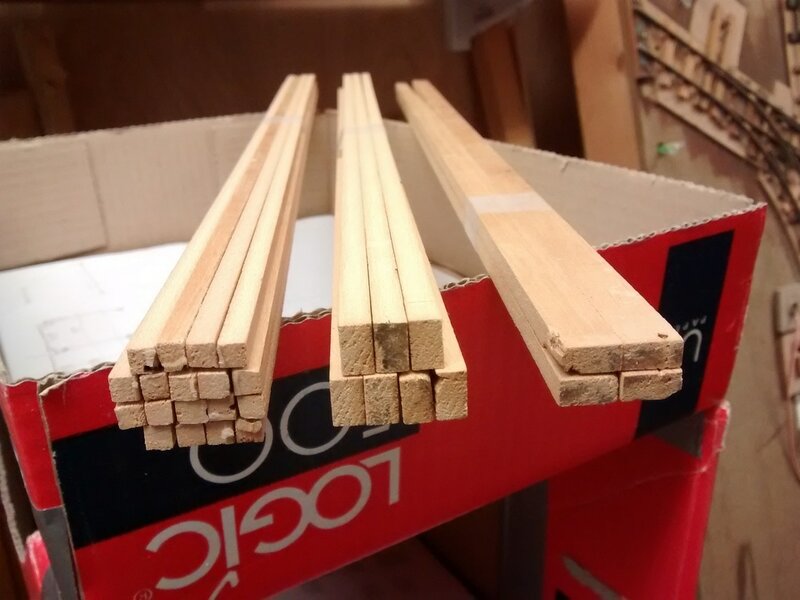 ​​Core - Two layers of 5mm black Polyboard were glued together, sandwiched between two solid sheets of chipboard to ensure it was flat. It was made oversize to allow for trimming as the structure developed. Soffit - Whilst cardboard strips was an option for the soffit boards, timber felt much better. 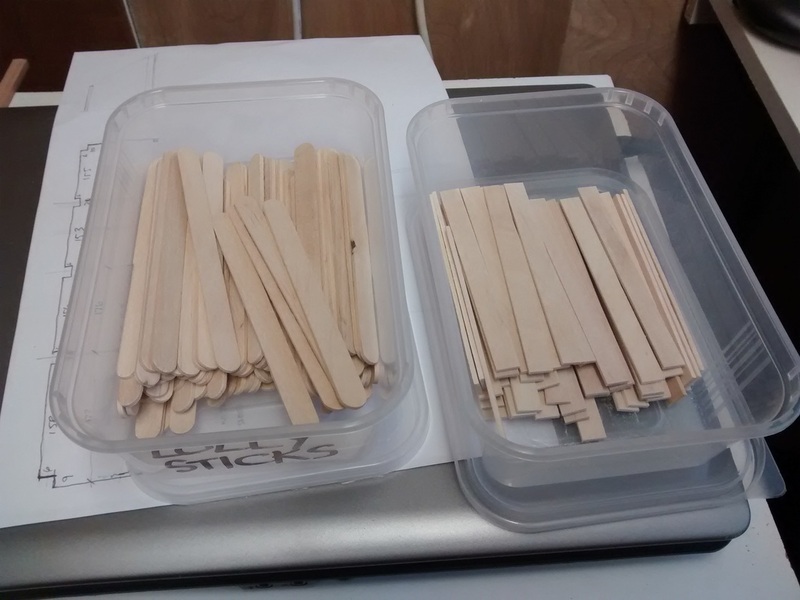 With the growth in crafts, lolly sticks have become readily available, and Wlikinsons was selected as the supplier. These are 115mm long and 10.5/11mm wide. They are over-scale in width, but the slope of the roof should disguise this, to some extent. 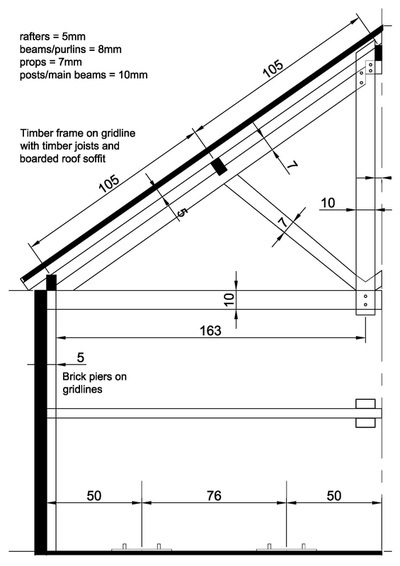 The sketch of the rafters that had been prepared, indicated that 25mm centres was acceptable, which meant 100mm prepared sticks would be ideal and very economical. 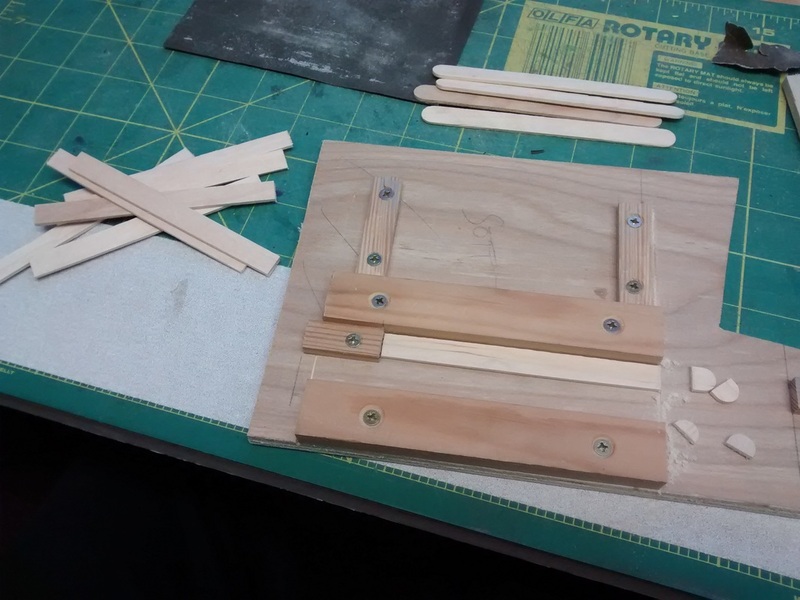 An extra block was fitted to the wagon cassis jig and a process adopted whereby an end was trimmed, the stick cut to 100mm and all edges lightly sanded. Sticks were also checked for straightness and rogue sticks sanded flat. It became a 'hospital job' that could be undertaken when a few minutes of spare time arose. 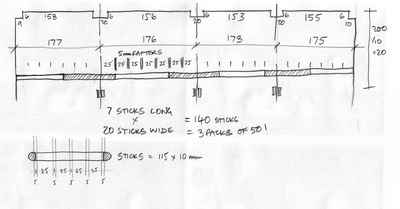 Lighting - This will be very important - i.e. 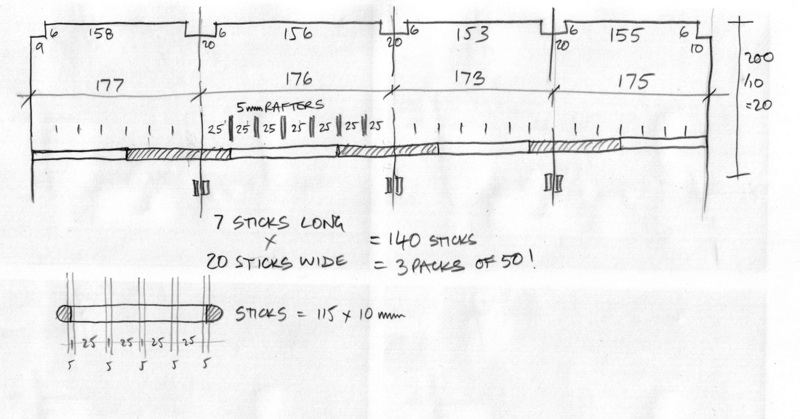 types of fitting, number, layout, height, light levels, etc. Filament lamps were considered, but LED's seemed a better option to pursue initially. A friend gave me some left-over fittings he had been trialling for fiddle-yard lighting on his layout. Poundland - 2 fittings in a packet! 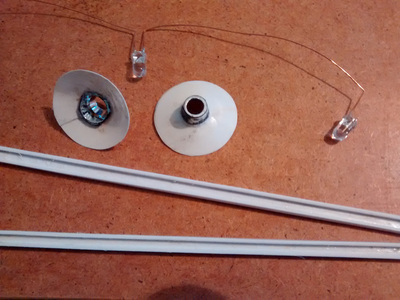 Three LED's in each fitting with resistor and reflectors. ​The LED's were unsoldered from the circuit boards and had very short connections. Transformer armature wire was used to connect them as it would fit in the fabricated plasticard trunking. The chrome reflectors were cut out of the fitting, filed to shape and plasticard shades added. A dedicated 12v supply was sourced to ensure that no interference from other circuits occurred. 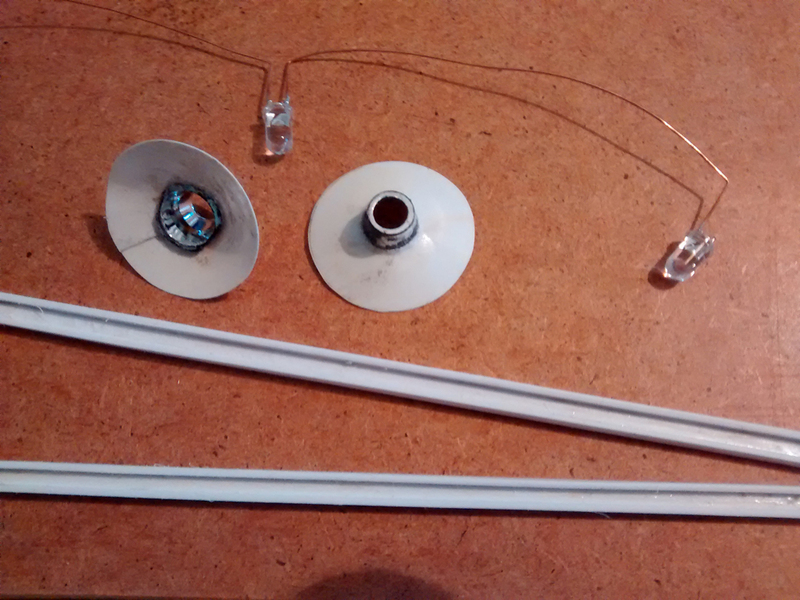 Two lamps per bay didn't lend itself to LED's in threes, so they were wired in fours. The resistor was recalculated and a small board made-up for them all. 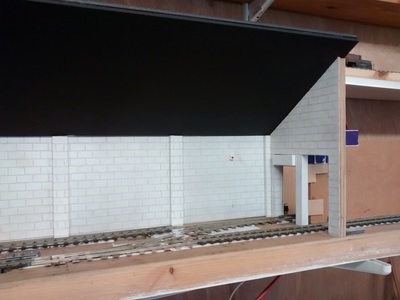 An initial scheme of four circuits is planned, but trials will be undertaken when the roof is more advanced.